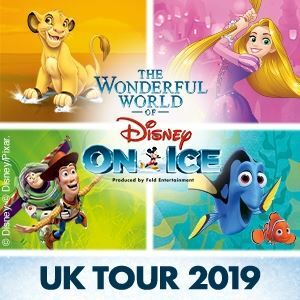 Prepare to enter a World of Fantasy as the Feld group present the latest Disney on Ice spectacular at the LG Arena in Birmingham. 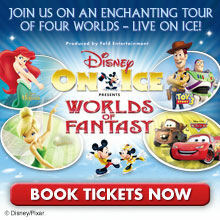 With a revitalised show for 2014, Worlds of Fantasy is the perfect family entertainment show bringing together all your favourite Disney characters with some amazing ice dancing. Now booking from the 13th of March through to Sunday the 16th March 2014 they include weekend matinee performances as well. Featuring Woody, Buzz, Jess and the Toy Story gang as well as characters from the Cars series. There’ll be the usual Disney favourites like Mickey, Minnie, Goofy and Donald as well as The Little Mermaid. 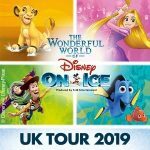 This Blog site is not associated with Disney On Ice or Feld Entertainment. All links are to official ticket sellers including Ticketmaster. This blog site does not sell tickets directly. Copyright Disney On Ice Tickets 2015 Magazine Premium created by c.bavota.